Artist, surfer, fly-fisherman. 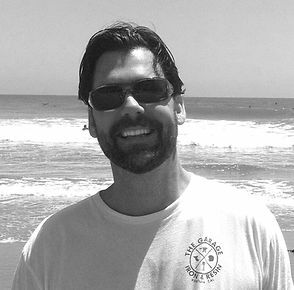 Glenn R. Gravett is best described as a seasoned surf industry artist and graphic designer of nearly 20 years who’s work is impressive in its depth. A Ventura, California resident, Glenn is the Art Director for Streamline Design & Silkscreen, home of Coastal Classics, a private label surf wear and Old Guys Rule. With a degree in art studio from UC Santa Barbara and the College of Creative Studies, Glenn has stayed true to his love for the arts and the outdoor lifestyle. Glenn’s work is inspired by his relationship with the ocean and by his surfing and fishing background. Originally a surfboard shaper, Glenn is well versed in surf history and the evolution and roots of surf graphics, apparel and fine art. Growing up tying his own flies and making his own rods as a third generation fly-fisherman, he finds this addiction the perfect compliment for his creative inspiration. Surf history is one of Glenn’s specialized subject matters in his fine art career and he is currently working on a series titled The Legends of Surfing. Developing relationships with some of surfing’s pioneers has given him an incredible education and allowed him access to some of the sports most well know images and photographs.